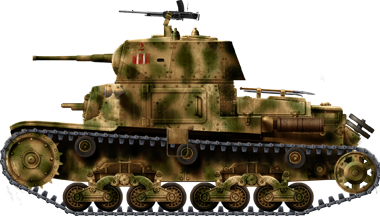 The specification for the M13/40 was first issued in December 1937 by the Regio Esercito. It was intended as a replacement for older models, namely the FIAT L3 tankettes and the medium M11/39, an interim tank with a hull main gun. To save time, the M13/40 was based on the M11/39, but with a completely redesigned upper hull. It had a turret wide enough to hold a 47 mm (1.85 in) Breda modello 35, an excellent AT gun with performances quite similar to the Russian ZiS 45 mm (1.77 in) used by their T-26s and BTs. Firepower was supplemented by twin Breda 8 mm (0.31 in) machine-guns in the hull, and an extra coaxial 8 mm (0.31 in), firing tracing shots. The British Vickers Mark E was also a clear inspiration. The Carro Medio Modello M13/40 was placed under the responsibility and supervision of the head of Inspectorate of Technical Services, General Caracciolo di Feroleto. Under his orders, Ansaldo delivered no less than fifteen prototypes of pre-production, the first being ready in October 1939. It was accepted in service after some changes and production set-up in March 1940. The entire lower hull of the former M11/39 was kept unchanged, except for some details in the fixations of the bogies and idler. The suspension still consisted of two bogies per side, each with semi elliptic leaf springs, and each with a twin set of roadwheels, which were bigger than on the M11/39. There were also three return rollers. The bogies were reinforced, due to the added weight of the up-armored hull. The latter, still bolted, was made of armored plates fixed on a steel frame, and were thickened, from 25 mm (0.98 in) on the sides to 30 mm (1.13 in) on the rounded glacis, and 42 mm (1.65 in) for the gun mantlet and turret front. The weight rose, accordingly, from 11 to 13 tons, nearly 13.5 short tons. The FIAT V8 diesel was sturdy and innovative, but the new version only gave 125 hp (93 kW). The speed was therefore limited to 32 km/h (20 mph) in the best conditions, but the range was excellent. Like the former model, the transmission crossed the hull and drove the front drive sprocket, with a reduction gear. Steering was obtained with a wheel and braking gears. The giant leap forward was the fully revolving, two-man turret, wide enough to accommodate a 47 mm (1.85 in) gun, which had excellent characteristics and was the M13/40’s best asset. The first M13/40 had no radio. The crew reached four, freeing the commander, seated in the right side of the turret, from some tasks and allowing him to concentrate on effectively leading the tank. The driver was located on the front left, and the machine-gunner/radioman at the front right. All vehicles were equipped with a towing hook at the rear and towing pintles. Sometimes a fourth machine-gun was mounted on on a flexible AA mount placed on the turret roof. The first series was characterized by having no radio and long mudguards at the rear. The next series had the latter cut short, while some radios were fitted. All models had the turret gun slots open, a telescopic gunsight, two roof periscopes and a two-pieced hatch. The 47 mm (1.85 in) gun, which had a muzzle velocity of 2,060 ft/s, could be fired either by pedal or hand. The turret was hydraulically traversed, with a manual backup, and in many cases the crew removed the cumbersome traverse system. The hull possessed four circular pistol ports, two at the front and two at the rear. In June 1942, another order came for 542 machines. Production was then pushed to a monthly rate of 22 tanks, and rose to 50-60 in December 1940, all being assembled by Ansaldo-Fossati, with FIAT engines and mechanical parts. The gun and machine-guns were delivered by Breda. Production figures, according to most sources and the factory diary, are 779 until its replacement by the better M14/41. The M13/40 led to the very similar M14/41 and M15/42. Its most famous derivative is the Semovente 75/18. 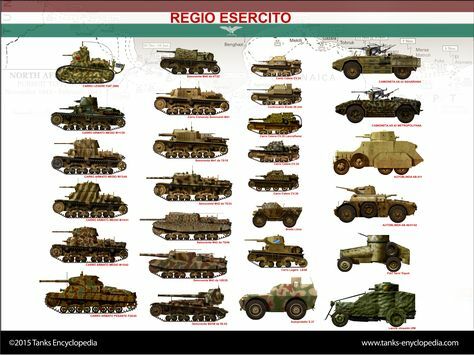 In all, nearly 3000 tanks would be built on this chassis or those derived from it, providing the bulk of Italian tank force during WW2. Because of the high production numbers, nearly all Italian armored divisions received large amounts of these tanks, which replaced older models. First engagements came with the Albanian and Greek campaigns in late 1940, and of course the North African campaign, where most soldiered until 1943. Their first engagement in the desert campaign was with the Babini Brigade in December 1940, during operation Compass. They fought at Derna, and later at Bardia against the Australians. During the British offensive, many M13/40s were captured in good condition and were later reused. The Australian ones fought notably at Tobruk, displaying large kangaroos on their hull and turret. They took part, with the Ariete Division, in the siege of Tobruk, while others were seen at the battle of Bir-El-Gobi. By April 1941, when the Afrika Korps came in force, the Italians had 240 M13/40 in battle order, but the following events proved that this model was not armored enough. Many crews choose to pile sandbags on their hull glacis, but this only contributed to overheating the engine, less speed and more breakdowns. 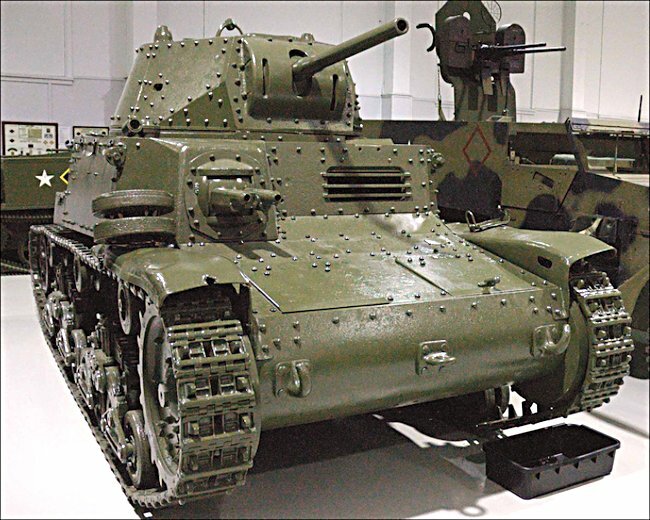 Although they were still massively used during the first battle of El Alamein, by the time of the second (fall 1942), the Shermans proved more than a match for them. Losses rose continuously, and the remainder from the armored divisions Littorio, Ariete and Centauro, and later the Trieste Motorized Division, were destroyed during the retreat towards Tunisia and the ensuing campaign. Some were also kept in mainland Italy, taking part in the Yugoslavian campaign and being later used for anti-partisan actions. 22 were ultimately captured and reused, after November 1943, by the Germans (2nd SS SturmGeschütz detachments and the Panzerabteilung Adria). The M13/40 had undeniably good characteristics, including relative ease of production, a sober diesel engine and an efficient gun. It was capable of piercing 45 mm (2.16 in) of armor at 500 m (550 yards), with an effective HE round and good secondary firepower. It could disable most British light, medium and cruiser tanks until 1942, but was harmless against British infantry tanks, like the Matilda and Valentine. The bolted hull presented a danger for the crew at every impact, and the hull plates had a tendency to crack. Plus, the mechanical parts and the engine itself proved unreliable on the long run. The speed was below-average in proportion to the weight. This, combined with a simplistic construction, made it more vulnerable to artillery fire. Because of this, the M13/40 was considered obsolete by the beginning of 1942. However, many M13/40s survived the war. – The M13/40 Centro Radio was equipped with a RF1 CA and a RF2 CA radios, two serving with each battalion HQ. – The Semovente da 75/18 was the main assault SPG conversion, inspired by the German StuG. 60 were built on the M13/40 chassis, with more built on the M14/41. – The Semovente Commando M40 was a turretless version equipped with a powerful set of long range radios. 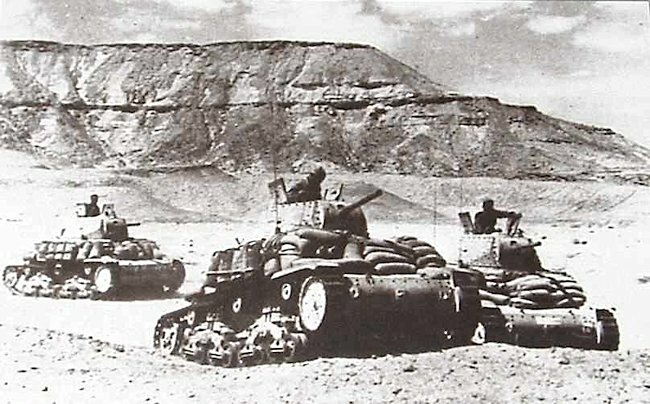 Early production M13/40 from the 132nd Tank Regiment, Ariete Division in Libya, fall 1941. Over 100 M13/40s were captured at Beda Fomm. Some equipped the British 6th Royal Tanks and the Australian 6th Cavalry. Here is one of the squadron “Dingo” at Tobruk, October 1941. M13/40 in Greece, April/May 1941. M13/40 of an unknown unit, second battle of El Alamein, November 1942. Notice the extra protection consisting of spare tracks and sandbags, which had dire consequences for the engine. Surviving M13/40 of the Centauro division, Tunisia, early 1943. Notice the fourth Breda 8 mm(0.31 in) on an AA mount. M13/40 of an unknown unit, Italy, mid-1943. German Captured Pz.Kpfw. 736(i) M13/40 of the Pz.Abt.V SS-Gebirgs-Division “Prinz Eugen”, identified by the runic symbol. This unit used a total of 45 related tanks in the Balkans and northern Italy in 1944-45, including M14/41 and M15/42 models. Semovente da 75/18, Vth Gun Group, 132nd Armored Division “Ariete”, Bir Hakeim, May 1941. This was the main derivative of the M13/40.